Hollywood Studios has a pretty solid line-up of Character Meet and Greets, including some great Character Meals. This is a continuation of our Back to Basics Series. Scroll to the bottom to see our other Basics posts. Hollywood Studios offers some interesting characters, but it is worth noting that right now the park is under quite a bit of construction, which means that there could be more changes to character meet and greet offerings and locations than one might expect. For example, although you can meet Mike and Sulley from Monster’s Inc. at the moment, that character meet is scheduled to be closed on April 2, 2016. Just remember to double-check the character schedules right before your trip so you’re not taken unaware in the event any last-minute shuffling is done. 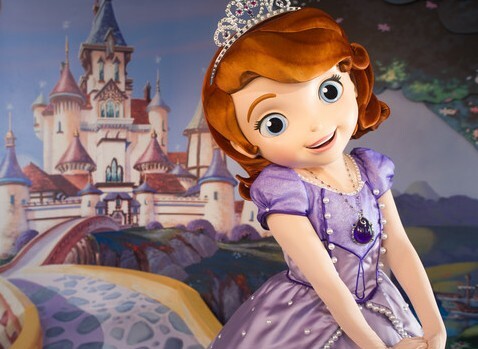 One of the major themes that seem to be occurring with my character meet and greet articles is that Disney has decided that right now is the best time to shuffle characters around! (I’m not kidding – the Epcot article was written and scheduled and the day before it was published Disney removed THREE of Epcot’s meets. Sigh.) Anyway, as I’m penning this particular article another announcement has come forth about adding new characters at Hollywood Studios. Check out this Touring Plans article for details about the new Olaf and Mickey and Minnie meets, which are coming soon. Disney has a few disclaimers when it comes to their meet and greets, namely that they can change at any time. In reality, this usually only applies to the characters that don’t have an indoor home. For example, you’re pretty much always going to be able to meet Kylo Ren and Chewbacca in the Star Wars Launch Bay, but if it is raining or other unforeseen circumstances arise characters like the Green Army Men might have one or more of their appearances cancelled. Only once have I ever been told that a character wouldn’t be meeting for an entire day due to illness, so remember that even Fairy Godmothers can be under the weather! Meet and greets are a lot of fun, but keep in mind that there are things you can do to make them even more memorable (and less awkward). If you have kids, have the camera ready for the candid photos. Heck, if you’re a party of adults still have someone assigned to have the camera ready for the crazy interactions forthcoming. The posed ones are nice and all, but that moment that kids (and adults) are first interacting with a character can be gold! This was one of those things that just happened – always have your camera ready! Getting autographs can break the ice. If you or your child is shy, a great way to break the ice with a character is to have them sign something. I recommend not giving in to the autograph books that you buy in the parks – if it must be a book, make your own or order one from Etsy. They’re much nicer and much less likely to get tossed aside after the trip (especially if you leave in a spot to put photos next to the autographs!). Even better than having characters autograph books is having them autograph something unique. I’ve seen people getting autographs on t-shirts and photo mats, and I even made an easy pillowcase for my nephew that was his “autograph book.” (He still loves it!) I’m also insane enough to have created a custom character quilt top that I’m accumulating as many autographs on as possible. (Inspired, in fact, by this TouringPlans article about getting shoes autographed.) Truth be told, the sky is the limit here. Let your imagination run wild and you can come up with amazing ideas for character autographs! Autographs never get old and are a great way to start an interaction. Come up with questions for characters that relate back to their story. 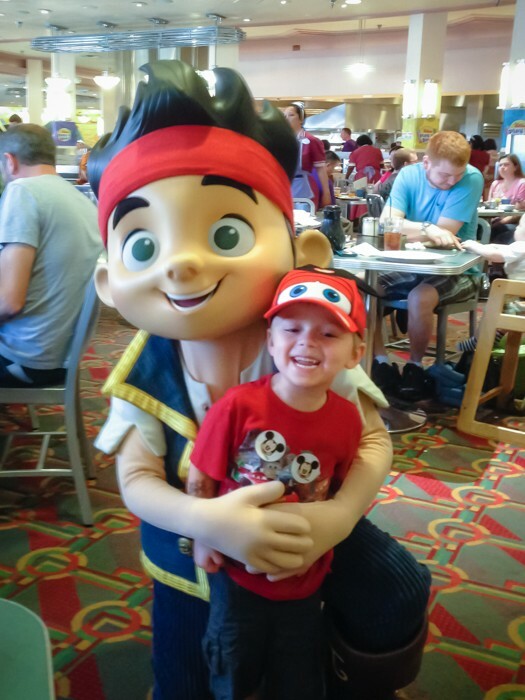 Whether you are the one meeting the character or you’re prepping your child for an interaction, a great exercise you can do while you’re waiting in line is thinking of funny questions or comments to make to a character based on their movie. 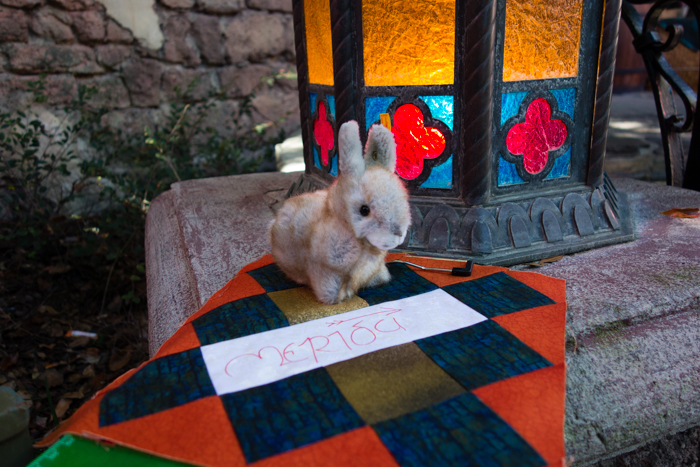 (Time for a new anecdote…) For example, when I met Merida and had her sign her quilt block, I pointed out that the colors I used to make her block were from her clan’s tartan. This sparked a great conversation about her family history and led to a pretty cool interaction. 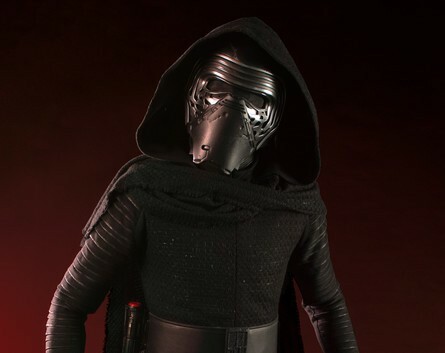 (I still kind of can’t wait until I meet Kylo Ren in the Star Wars Launch Bay so I can ask him if he wears a mask to hide his soulful eyes…) The more you interact with a character and are willing to “buy in” to their premise, the more animated of an interaction you’ll get. This goes for fur characters (Mickey, Pluto, etc.) and face characters (princes and princesses, etc.) Fur characters are great at pantomime, so don’t be put off asking them questions just because they can’t speak. Consider springing for Kenny the Pirate’s Character Locator App. What is this magical character locator app, you ask? It’s only the most efficient way to systematically attack character meet and greets! It’s not a traditional app that you can get from the app store – instead just visit his website and sign up for the service. The cost is $6.99 and it will allow you to access his app on your desktop, as well as including instructions for putting a link to his app on your phone. The app details every single character you can meet in all four parks, along with specific meeting times (GREAT for not having to continually consult a times guide), the best times to visit characters for the lowest lines, which characters meet in multiple parks (and the park with the shortest lines for that character), as well as specific tips on things to say to each character you meet. Remember my suggestion for coming up with questions or comments for characters? Kenny gives you awesome suggestions right in the character detail. I purchased his app when I started my crazy signature quilt obsession, and I can tell you that it would have been far more challenging to attempt that using a times guide. Kenny’s app will always default to show you the current or next meeting time for a character, which makes it a lot easier to determine where you should head next. Having used it extensively, I can wholeheartedly endorse it! 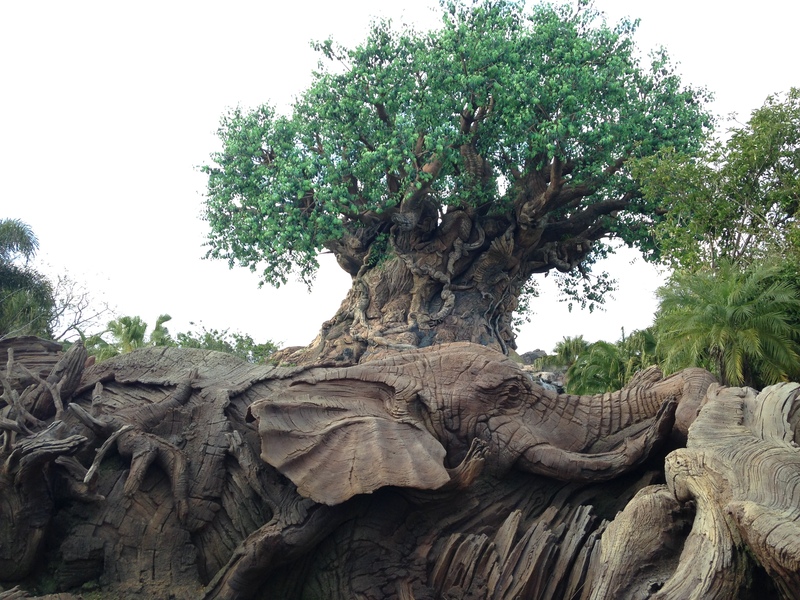 I’m going to tackle a tour of the characters at Hollywood Studios in the same manner I did with Animal Kingdom – land by land. Right now the only continual meet and greets (meaning you don’t need a times guide to figure out when their sets are) are the Star Wars characters meeting in the Launch Bay. All of the other character meet and greet opportunities are intermittent – consult a times guide, ask a cast member, or use Kenny’s app to find out exactly when and where they’ll be out. Hollywood Studios is the only place to find Disney Junior Characters, and of course they’re dominating the Disney Junior Courtyard. All of the characters meeting in the courtyard meet for the majority of the day. They might not technically be continual since they don’t meet from park open to park close, but a random check on the Walt Disney World website indicated that they generally meet from 9:30 am to 6:30 pm at this time of year. After you walk the length of Hollywood Boulevard and enter the center of the park you’ll find yourself near the part of the park designated as Center Stage. (This is the big open area in front of the Great Movie Ride.) It is in this general vicinity that you can often find a variety of Disney characters meeting, including Daisy Duck, Donald Duck, Chip and Dale, Pluto, and Goofy. These meets are intermittent, and even though these characters meet in several parks they do have some rather snazzy outfits that you can only find Hollywood Studios. 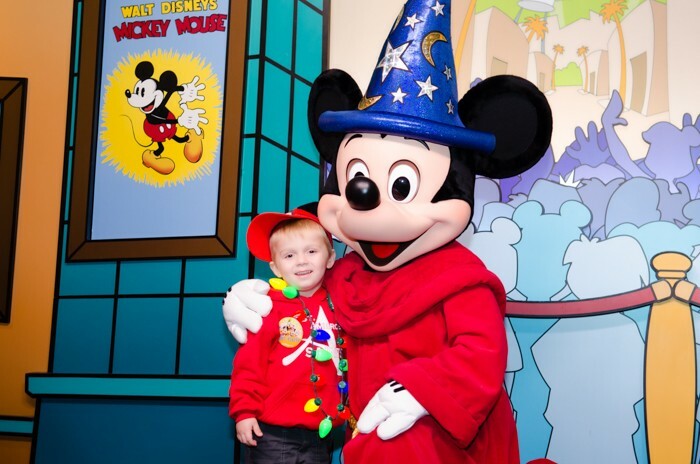 Even though he’d already met Mickey in another park, he thought Sorcerer Mickey was too fantastic to pass up at Hollywood Studios! I’m sure it isn’t surprising for you to find out that on Mickey Avenue you can meet the most famous mouse in the land – Mickey. 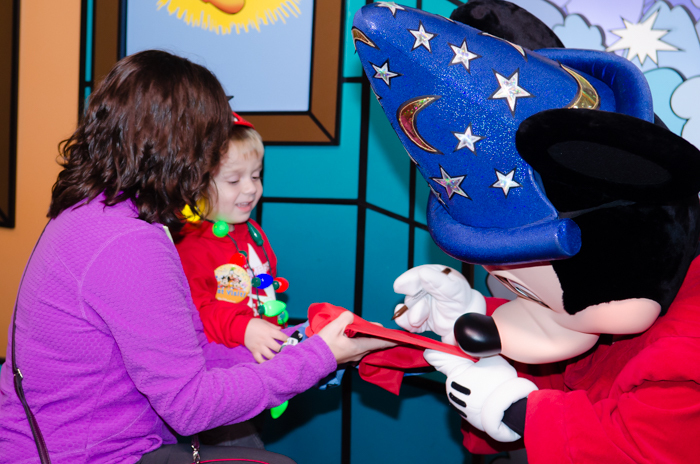 Located by One Man’s Dream, Mickey is meeting folks while wearing his fabulous Sorcerer’s Apprentice robes and hat. This character meet is probably my favorite of all the Mickey meets, as the photo op is just amazing. Although this meet doesn’t take place from park opening to park closing, it is pretty close to continual as it runs for the vast majority of the day. Continue your journey past One Man’s Dream and Sorcerer Mickey’s character meet and you’ll find yourself in Pixar Place. Directly across from Toy Story Midway Mania is an indoor meet with Woody and Buzz Lightyear. There are a lot of positive things about this meet – it is indoors, Woody and Buzz meet together, and it runs for almost the entire day (much like the Mickey greet above). The downside is that it always has a pretty hefty line. I have personally never waited in the line, simply because it always seems to have a wait of 45-ish minutes. Out on the streets of Pixar Place there is another opportunity to meet some great characters from the incomparable Toy Story. Of course I’m talking about the always active Green Army Men! These guys are amazing and they truly interact with you to create some unique memories. They meet intermittently, but they usually don’t develop a long line as there are often two or three of them out at once. 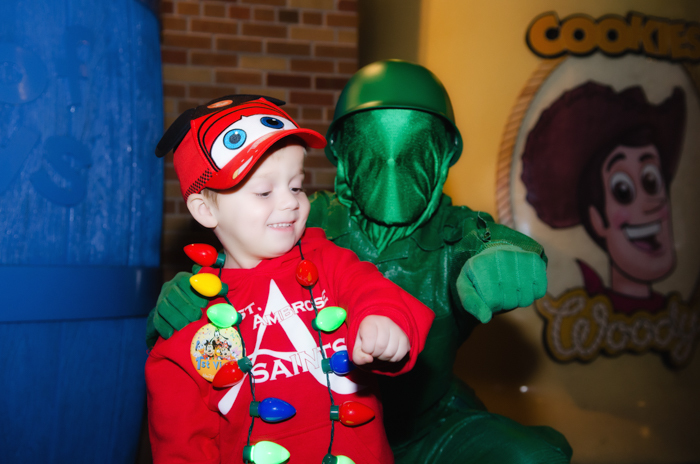 The Green Army Men are highly entertaining! For just a little while longer you can find Mike and Sulley from Monsters Inc. in the backlot near the Streets of America. If you want to catch the two of them before they disappear into the monster world, make sure you stop by before April 2, 2016. Hollywood and Vine was quite the hit of this particular trip! Hollywood Studios gives us two different character meals, both of which take place at the same location – Hollywood and Vine. 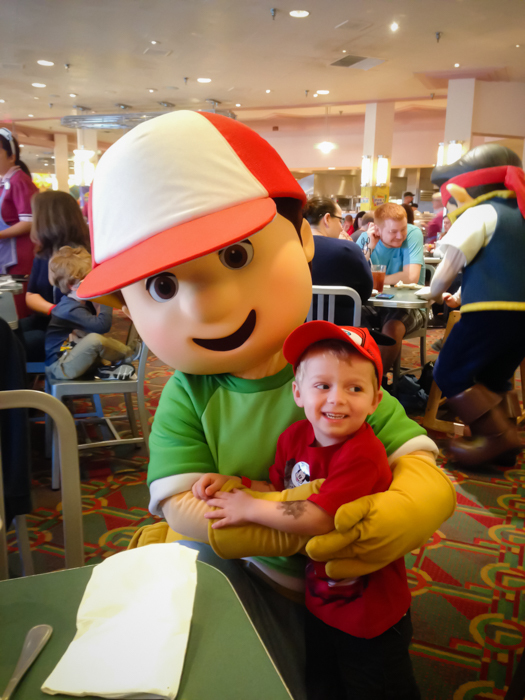 For breakfast and lunch you can take part in Disney Junior’s Play n’ Dine, which includes such characters as Doc McStuffins, Sofia the First, Jake, and Handy Manny. The food itself is a buffet, with a wide range of options for both meals. While the food might not be the finest cuisine out there, the characters are certainly top-notch! For dinner you can participate in Minnie’s Seasonal Dining, which features Minnie, Mickey, Donald, Daisy, and Goofy all wearing special, seasonal attire. Dinner is also a buffet, and while it might not be the best dinner on property, it is one I quite enjoy. With a massive selection of offerings it should be easy to find something for even the pickiest of eaters. I haven’t actually dined there since Minnie’s Seasonal Dining began, but based on my knowledge of the food from prior visits and the character line-up, I’m sure I will be dining seasonally with Minnie at some point! Okay, so maybe saying Hollywood Studios has only two character meals is a bit misleading, but truth be told I’m not entirely certain if I would categorize Club Villain as a character meal. Club Villain is a new dance and dine event that takes place in the Sunset Showcase. The cost for the experience is $129 per person and it is open on Tuesdays and Saturdays. I honestly have no insider info on Club Villain, and the high price means I probably never will. The event features Dr. Facilier as the host for the evening, with appearances from Maleficent, the Queen of Hearts, the Evil Queen, and Cruella De Vil. The food is inspired by New Orleans and the layout of the venue is banquet style, meaning multiple parties can be seated together. This concludes the Hollywood Studios edition of my Character Meet and Greet series! 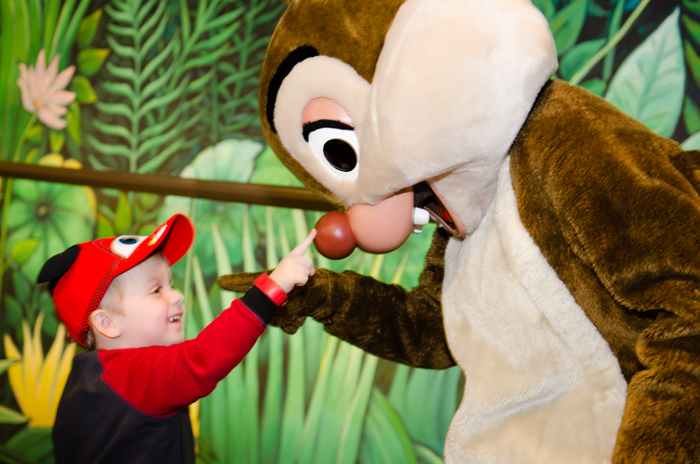 Do you have any special tips for interacting with characters? Cool souvenirs you like to get autographs on? 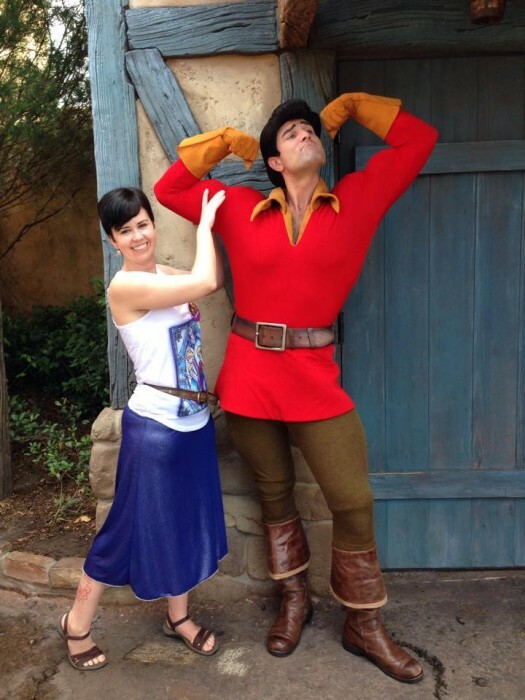 Special photo poses for particular characters at Hollywood Studios? Tips on whether or not Club Villain is worth it? Please share in the comments! I am a confessed Disney World addict who will do anything I can to build up anticipation for upcoming trips and extend the magic after I return from my adventures in the World. This means I'm always crafting new accessories and outfits for my Disney Bounding, as well as editing photos (amateur Disney photographer) and creating photo books from previous trips. (It's not like there is anything else to do in Michigan!) My husband and I are subjects to three very demanding cats, who are benevolent enough to let us take several trips a year, as long as we pay them appropriate tribute. I work full-time as the Development Director for a local non-profit, which is something that absolutely I love. For random thoughts on Disney and geekery of all kinds, follow me on Twitter @Angela_Wilhelm! Heard anything about the Star Wars breakfast making a return? Are the lines to meet Chewie at SWLB pretty short early in the day (during EMH, even)? My group doesn’t include kids, so Chewie is the only character meet we’re considering, but even so, we’d like to avoid waiting a bunch for it. My guess is yes. Kylo Ren supposedly has a longer line than Chewie and the male part of my family met him at 9:30am without much of a line. The girls were busy meeting Sofia, Doc McStuffins, Minnie, & Jake, all from 9:30-10. Of note, we also met Buzz and Woody ~9:15 with only a few minutes wait. This was on a busy day during vacation week. That’s awesome! Your comments bring up a great point – if meeting characters is a high priority for someone, it’s best to treat them just like you would a popular attraction you want to experience. Use the early morning hours to your advantage! Thanks for sharing, Felicia! Woody’s Round Up is really great. Besides the picture with Woody & Buzz, while you wait you can take pictures (with your own camera) of yourself in fun Toy Story situations (being picked up by the claw…blasting off on Sid’s rocket) and thr actual picture with awoody and Buzz has a set that makes it look like you’re a toy on Andy’s bed. We waited about a half hour and felt it was worth it. Also, Minnie’s on Mickey Mouse Clubhouse and has tons of BowToon shorts on Disney Jr, so I imagine that’s why she’s there. That’s awesome! Sounds like Woody’s Round Up might be worth checking out the next time I’m there. 🙂 And good call on Minnie’s placement in the Disney Junior world – I’m pretty far removed from all that is Disney Junior, and I hadn’t realized she was such a part of things!